Shimoza-An is the lower level of almost 100 years old Kyoto machiya, traditional Kyoto townhouse. Our New York architect based in Kyoto Geoffrey P. Moussas renovated it to make this old house a special place where to stay with your family and friends during your vacation in this beautiful historical city of Japan. 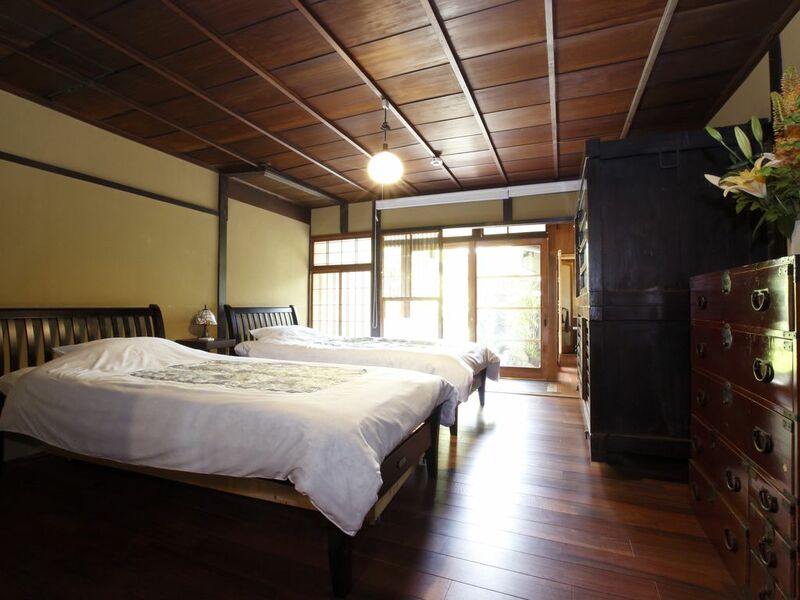 There are one tatami mats rooms where to sleep with futons, one bedroom with 2 single beds and a western style living room with table, chairs, sofa, modern kitchen, antique furniture, tub bath and shower, high-tech toilet, air conditioner, floor heating. It is located on quiet Kamanza street that in few meters ends in Sanjo street, one of the oldest and main streets in Kyoto crossing the city from East to West. This street has been very important in the Kyoto history for many events happened here, and today you can enjoy the craft shops, the old houses, its museums and numerous art galleries, local temples and shrines or cafes, restaurants and the very exciting Shopping District, one of the oldest in Kyoto with also the most modern goods and latest fashion, and elegant department stores. Nearby, in the other side of Horikawa street there is a calm and 60's-70' s atmosphere Sanjo shopping arcade. There are many kinds of shops and you can see local culture. Shimoza-An is the perfect place in the mid of cultural, traditional, innovative Kyoto heart! RATES ARE IN JAPANESE YEN. If you come to the house more than the number of people you booked, we will charge you extra fee. You can have a look at other properties in Kiyomizu area: Shofu-an #438156 Bairin-an #438160. The benefits of this townhouse is keeping the traditional sides and add some modern touch to satisfy our international guests needs, and also the location: in central Kyoto but in a quiet street. At five minutes walking distance there is Nijo Castle, where the Shogun lived, old more than 400 hundreds years. Many other places to visit are at a walking distance, like Rokkakudo Temple called the navel of Kyoto connected with the famous ikebana school Ikenobo, the Imperial Park, or colourfull Nishiki food market. Bus stops are very close as banks, post office, museums, art galleries, every kind of restaurants, cafes, bars...and more and more! 2 stops to Downtown and Gion area. You can enjoy shopping, restaurant and sightseeing. Also, you can easily find eateries and grocery store around the property. We were are family of 5 adults and 1 toddler and there was enough space for us. The location and cleanliness of the accommodation was 10/10. There is a convenient store and starbucks just around the corner. The walk to the nearest train station is about 5 minutes. The host/staff was very friendly and helpful. Overall we enjoyed our stay very much. Thank you very much for your kind an detailed review. we appreciate you comments of our house and service much. We are pleased you enjoyed your selves. we look forward to seeing you again. We recently spent 5 nights at this wonderful traditional machiya which is close to the subway, restaurants, and grocery. We had five adults and one infant. Futons were set up in the tatami room for the younger adults and baby. Grandparents had the raised futons in the back room. The place was spotless and a real pleasure to stay in. It has been recently renovated to combine traditional elements with modern amenities. We appreciated the kitchen table, chairs, and sofa. The check-in and check-out procedures were efficient. There is not a lot of privacy between rooms which did not bother us. The bath and toilet are in the back and most easily accessible by going through the back bedroom (although it is possible to get to the bath from the kitchen by going through the laundry room, this is not real practical). This home is ideal for a couple or small family. We would stay here again. Making reservation and payment was very straight forward. There was a hitch when we made our payment but the team was extremely helpful with it. Nothing was too much of a hassle even reservation of restaurants and taxi. Upon arriving, everything was already ready for us. The accommodation had everything we need. The air conditioner is definitely a massive plus given the very hot and humid autumn. Washing machine is also a dryer which is fantastic. Close to a subway exit and it is at the intersection of two lines. There is a pharmacy and 2 convenience stores close by. Overall it was a very comfortable stay for us all. We enjoy our stay in this machiya, well located in the West part of Kyoto. The property is really convenient for 4 people. Lovely garden and comfortable bathroom. Warm and reliable welcoming by Mariko. Could have been excellent if the accommodation would have been less noisy (thin wooden doors, very noisy neighbours upstairs). But it´s nothing compared with the pleasure we had to visit Kyoto from there ! Kyoto is wonderful city and this Machiya made it even more so. We spent five nights and enjoyed every moment. This is a lovely traditional house with great charm, yet modern amenities. It's in a perfect location. Very quiet, but near all the sights, shopping and transportation. The house was very clean and the shower is probably the best we have ever encountered. The futons were extremely comfortable. If we get a chance to return to Kyoto, this will be our place to stay. This is our first family trip to Japan. With two young children, this property was perfect for our needs. It is in a very quiet and safe neighborhood with no busy tourism stuff going on. Yet it is very convenient by being close to subway stations and major streets. There is also a small market just several minutes of walking from the rental property, which has milk, bread, eggs etc in case we need anything. The house has the traditional charms and modern amenities. We enjoyed the shower particularly. The washer/dryer was definitely helpful when you have young kids traveling. It was very comfortable for the four of us with floor heating and air conditioning during a November stay. Mariko is very responsive, friendly and helpful. She speaks fluent English which is a great help for our stay. Prior to our arrival, she gave us tips on how to travel to Kyoto etc. During our stay, she recommended restaurants and even helped to make reservations for us. We have already recommended this property to several friends for their future consideration. We wish we had a longer stay to fully explore Kyoto and enjoy Shimoza-an.